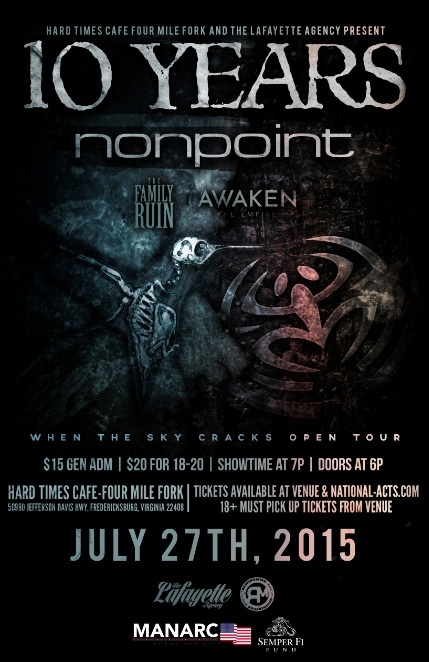 (FREDERICKSBURG, VA)-Hard Times Cafe-Four Mile Fork will host a concert event, ’When The Sky Cracks Open Tour‘ to benefit MANARC and the Semper Fi Fund on Monday, July 27 at 7 p.m. National touring acts, 10 YEARS and Nonpoint, with Special Guests The Family Ruin, and Awaken The Empire have teamed up for a unique musical event. A portion of tickets sales will go to benefit MANARC, Borne the Battle, a 501( C ) 3 is a non-profit organization and thrift store, established to support veterans in the Greater Fredericksburg region. MANARC will donate 100% of all funds raised to the Semper Fi Fund. The Semper Fi Fund, and its program America’s Fund, provide immediate financial assistance and lifetime support to post 9/11 wounded, critically ill and injured members of all branches of the U.S. Armed Forces, and their families. The fund aims to ensure that these veterans have the resources they need during their recovery and transition back to their communities. For more information, visit https://semperfifund.org. Glenn Melvin, owner and operator of Hard Times Cafe-Four Mile Fork has aimed to support local Fredericksburg area veterans by creating opportunities in conjunction with the national acts entering his live music venue. “I see the value and importance of supporting our local veterans. The partnerships that are created between the bands and veterans organizations impact our community as a whole,” said Melvin.